The Hotpoint 20 in. 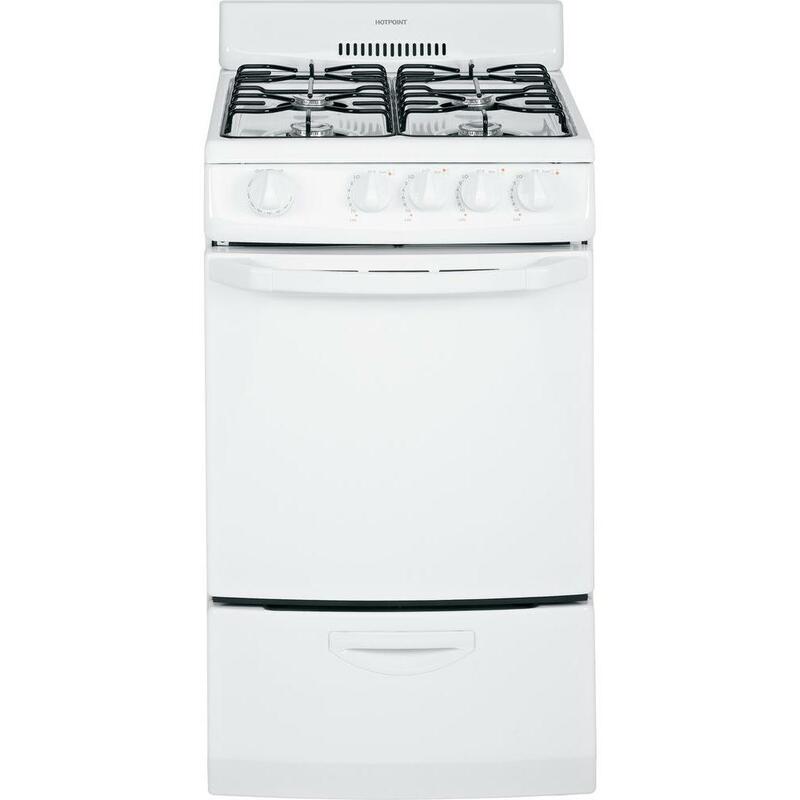 Freestanding Gas Range features a 2.4 cu. ft. oven capacity with 2 racks that accommodate a wide variety of sizes and types of cookware and 4 burners that deliver a wide range of heat output that meet the requirements of most cooking requirements. The 4 continuous steel grates help you easily move cookware between burners, and the 18,000 BTU broiler drawer supplies concentrated heat for fast, efficient browning. Well, I didn't like the conversion kit because I got bad vibes from it. So I started to carve one out of balsa wood and sold quite a few of them on a street corner. People thought I was some kind of deity or whatever. My oven, dryer, and hot water heater are all propane. I want to add an oven to an in-law suite. Hi ITM- This is Sue at GE Appliances. We are excited to hear of your interest! Yes, the range can be converted for use with LP (Propane). Thanks for checking with us. Enjoy! How do you use the oven? I bought this oven but I can't turn the oven on. Am I missing something? The oven can be turned on by using the oven temperature knob. Hi Lisa- This is Sue at GE Appliances. We are sorry to hear of the difficulty with the cooktop and suggest to view the instructions on page 17 of the Owner's Manual at the following link: http://www.homedepot.com/catalog/pdfImages/31/31b7e8f6-a279-4f4c-965b-7a08ceaf02bf.pdf - If the top does not snap back into place as indicated, we encourage you to contact GE Appliance Service at 1-800-432-2737 for assistance or conveniently schedule an appointment online at GEAppliances.com. Thanks for checking with us! 20 in. 2.4 cu. 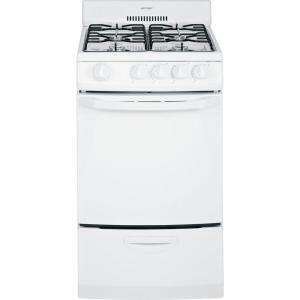 ft. Gas Range in White is rated 4.0 out of 5 by 12. Rated 4 out of 5 by Jerry from It's a stove... It has a electric ignition... It runs on natural gas... It's a stove. Nothing fancy or special about it. Home Depot provided free delivery & setup and a lower price than the comparably equipped equivalent from another local big box hardware/home improvement retailer. Setup was a nightmare though... No documentation on how to prep the location and a different design for the rear of the unit than the old stove it was replacing meant I had to have some unplanned plumbing work done. Rated 4 out of 5 by Fazzy from No problems Replaced old range that leaked gas. This one has pilotless iginition and does not leak gas any longer. Delivery went as promised - everything works fine. Home Depot had the best price overall. Rated 5 out of 5 by Deb in Philly from Perfect for small spaces. This gas range was installed in my apartment prior to my moving in. It's perfect for me. I went from a full size stainless steel electric glass top range with all the bells and whistles to this little guy. I prefer this GE unit by leaps and bounds. Its easy to keep clean and it simply works well. I've only been using it for a month now, but I can see getting many years of use out of it. Rated 4 out of 5 by Carrieboo from Great addition to our kitchen So happy to have a beautiful replacement for our "elderly" stove. It makes our remodeled kitchen look great!